For the book, see Ill Met by Moonlight. Ill Met by Moonlight (1957), also known as Night Ambush, is a film by the British writer-director-producer team of Michael Powell and Emeric Pressburger, and the last movie they made together through their production company, "The Archers". The film, which stars Dirk Bogarde and features Marius Goring, David Oxley, and Cyril Cusack, is based on the 1950 book Ill Met by Moonlight: The Abduction of General Kreipe by W. Stanley Moss, which is an account of events during the author's service on Crete during World War II as an agent of the Special Operations Executive (SOE). The title is a quotation from Shakespeare's A Midsummer Night's Dream, and the book features the young agents' capture and evacuation of the German general Heinrich Kreipe. During World War II, the Greek Mediterranean island of Crete was occupied by the Nazis. British officers Major Patrick Leigh Fermor DSO (Dirk Bogarde) and Captain Bill Stanley Moss MC (David Oxley) of the Special Operations Executive (SOE) land on the island. With the help of the local Cretan resistance in April 1944, they kidnap General Kreipe (Marius Goring), the commander of the island. They take Kreipe across rough country to a secluded cove on the far side of the island, where they are picked up and taken to Cairo, the Middle East headquarters of British forces. Dirk Bogarde as Major Patrick "Paddy" Leigh Fermor aka "Philedem"
David Oxley as Captain W. Stanley "Billy" Moss, M.C. Marius Goring had appeared in three other Powell and Pressburger films: The Spy in Black (1939), A Matter of Life and Death (1946) and The Red Shoes (1948). Goring replaced Curt Jürgens, who was the original choice to play the part of General Kreipe. Christopher Lee and David McCallum have small parts: Lee as a German officer in the dentist scene, and McCallum, in his film debut, as a sailor on the ship that picks up the group. Lee's part was edited out of the 1959 American re-release of the film. A "John Houseman" in the cast does not appear to be the well-known actor and director John Houseman. 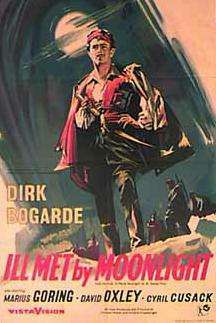 Ill Met By Moonlight was filmed at Pinewood Studios in England, with location shooting in the Alpes-Maritimes in France and Italy, and on the Côte d'Azur in France. The film was the seventh most popular movie at the British box office in 1957. The story was affectionately parodied by Spike Milligan in the 1957 Goon Show episode, "Ill Met by Goonlight". ↑ "Sir Patrick Leigh Fermor". The Daily Telegraph. 10 June 2011. ↑ Anderson, Lindsay and Dent, David. "Time For New Ideas." The Times (8 January 1958) 9. The Times Digital Archive. Web. 11 July 2012. Christie, Ian. Arrows of Desire: the films of Michael Powell and Emeric Pressburger. London: Faber & Faber, 1994. ISBN 0-571-16271-1. 163pp (illus. filmog. bibliog. index). Fermor, Patrick Leigh. Words of Mercury. John Murray, 2004. ISBN 0-7195-6105-1. Moss, W. Stanley. Ill Met by Moonlight. London: Harrap, 1950. ISBN 0-304-35259-4. Moss, W. Stanley. A War of Shadows. London: T.V. Boardman, 1952. OCLC: 2057976. 240pp (illus. 21 cm). Powell, Michael. A Life in Movies: An Autobiography. London: Heinemann, 1986. ISBN 0-434-59945-X. Powell, Michael. Million Dollar Movie. London: Heinemann, 1992. ISBN 0-434-59947-6. "Ill Met by Moonlight Expeditions". "Special Camp 11 – Prisoner Kreipe". Ill Met by Moonlight at the British Film Institute's Screenonline. Full synopsis and film stills (and clips viewable from UK libraries).